Tuscany, as the Allies pursue the Germans north at the end of WWII: traumatised by loss and carnage, Canadian nurse Hana (Binoche) decides to stay behind in an abandoned, bombed monastery and care for her dying patient (Fiennes). He seems to recall little of his life, but when Caravaggio (Dafoe), a vengeful, morphine-addicted thief, turns up and quizzes him over past dark secrets, and as Hana reads from his beloved Herodotos, memories return of the pre-war years when, as an archaeologist/cartographer in the Sahara, he had a passionate affair with Katharine (Scott Thomas), wife of a British colleague. 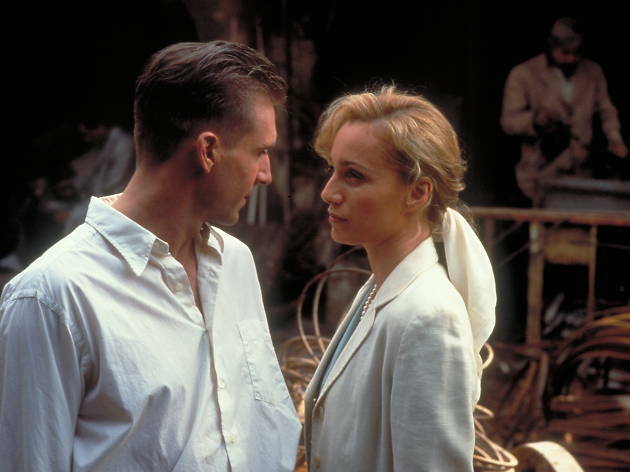 Though Anthony Minghella's adaptation of Michael Ondaatje's novel simplifies, jettisons and changes certain elements of the original story, it remains a rich, complex, entrancing piece of work. Part poignant romance, part suspenseful adventure, part enigmatic mystery, it's essentially a study in different responses to love and war, honour and betrayal, nationality and identity, falsehood and forgiveness, which sounds subtle echoes as the narrative flashes to and fro between two main time frames. Needless to say, the performances are flawless; more surprising is the fluency, poetry and scale of Minghella's direction (John Seale's sensuous desert photography is superb), equally eloquent whether depicting boudoir intimacies, bomb-disposal skills, drunken dementia or a deadly sandstorm.